This strong robust model provides extra impact with an extended length, extra long 25.12 inch pointer. to be further to the side of a presentation. It can present information to reinforce students' knowledge in the subject. - Extention length: approx. 638mm/ 25.12''. - Constriction length: approx. 128mm/ 5.0''. - Handle length: approx. 110mm/ 4.33''. - Classic styling with chrome finish and pocket clip. - Comfortable handle, sturdy when fully opened, not shaky. and so on, effectively point out key information when presenting or teaching. But please note that this pointer doesn't support the writing enter. Teaching Pointer 100% brand new and high quality. Classic styling with chrome finish and pocket clip. Durable, portable, extendable, retractable. Color: Black. Material: Stainless steel. Contraction length: 128mm/ 5.0''. Extention length: approx. 638mm/ 25.12''. Comfortable handle, sturdy when fully opened, not shaky. 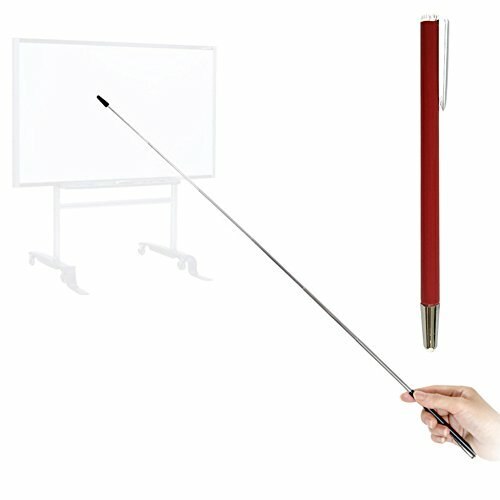 Suitable for traditional blackboard, electric whiteboard, it will not damage the screen. But please note that this pointer doesn't support the writing enter. No powerful laser pointer, presentation clicker, high power, lazer pointer pen, green. If you have any questions about this product by Day Tip, contact us by completing and submitting the form below. If you are looking for a specif part number, please include it with your message.